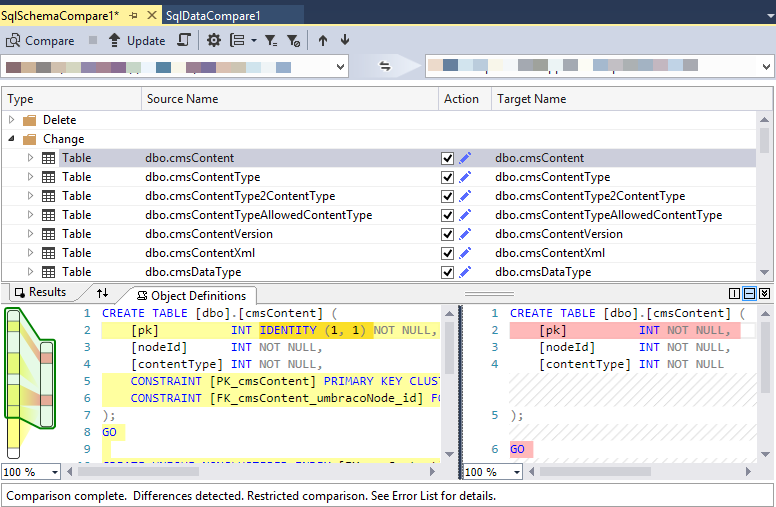 Visual Studio 2013 has Sql Server Data Tools built in. (Pro, Premium and Ultimate) We use it to compare and sync databases. The first time I started the data compare it did not work. When comparing the data between databases no tables could be selected. Tables and views must meet two criteria to appear in the listing. First, the schemas of the objects must match between the source and target databases. Second, only tables and views that have a primary key, a unique key, a unique index, or a unique constraint appear in the list. If no tables or views meet both criteria, the list will be empty. To correct missing keys and indexes or other object differences, do a schema compare. 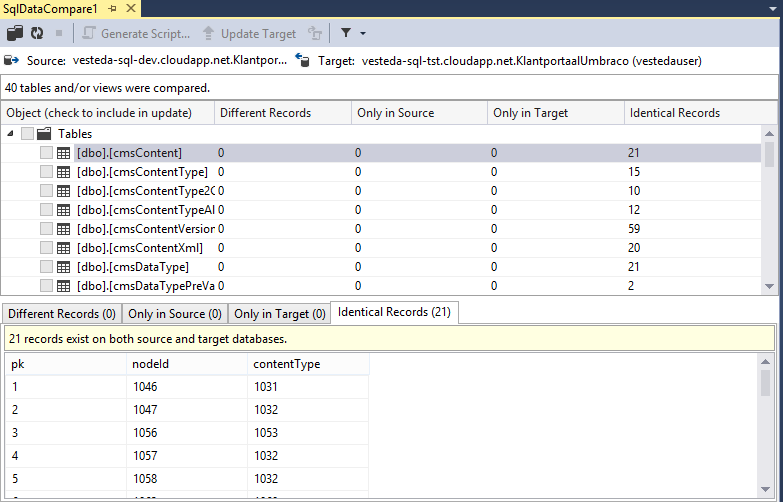 After the compare, click Update Target to create the missing indexes and keys. To save the changes for deployment use Generate Script. 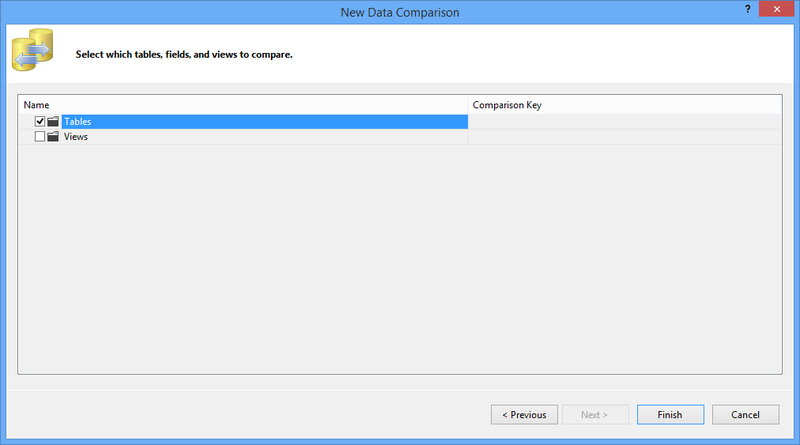 Data compare will now show data differences for the tables. There are none, because no changes were made after the Sql Server Export Data had run. When there are differences: as with schema compare you can Update Target for immediate sync or use Generate Script to save the changes for deployment. The data tools are a good option when you can connect to both environments with Visual Studio. You can create scripts for the changes and use that for your deployments. This entry was posted in Tooling and tagged data compare, schema compare, sql server data tools, sqlserver, visual studio, visual studio 2013. Bookmark the permalink. I don’t have SQL Server in my tools menu. How can I install the SSDT in VS2013? Since SQL Server tooling is included in VS, the updates will be pushed through VS Update and users will be prompted when VS is open. If you’d like to check for updates manually, open Visual Studio 2013 and choose the Tools > Extensions and Updates menu. SQL Server tooling updates will appear in the Updates list.